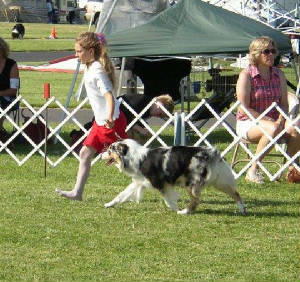 My daughter Kelsey was 4 years old when she first went into the show as a peewee handler in ASCA. We chose my moms dog "Bobby Sue" because of her obvious adoration for Kelsey, and her wonderful, forgiving, and honest temperament. Kelsey does not like to practice so it is a good thing she has a very natural inate ability to handle. 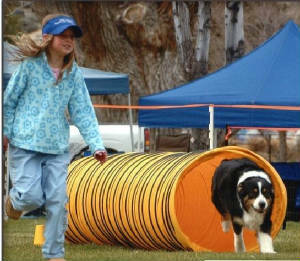 She started doing fun matches in agility with my dogs about when she was 5-6. Pictured below is Patty and Kelsey at a fun match. 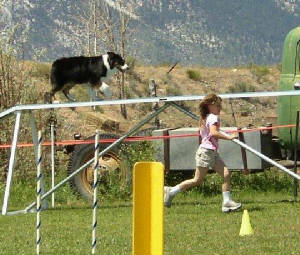 When Kelsey was about 7, it was decided that she was old enough to be able to keep track of a course in her head. At this point we let her try Bobby Sue in practice, and she started competing with her in competition. Kelsey and Bobby Sue have a link and Bobby truly wants to work with Kelsey to be a team. Bobby Sue is a soft dog who hates to make mistakes and does not like pressure. For some reason she rarely feels pressured with Kelsey. My dogs are true mommy's girls and so they will not work for Kelsey except for when she has cookies. They also do not have any forgiveness in them for her mistakes. If Kelsey does not tell them exactly what to do, and at the right time, they will just go around or they go slow. Not so with Bobby Sue, she reads Kelsey like a book. 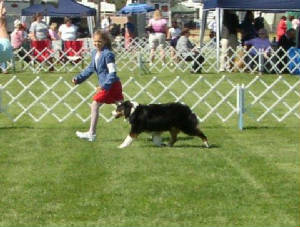 All Kelsey had to do is run, and give small directions for Bobby Sue to work like a pro. What a partnership and team!!. 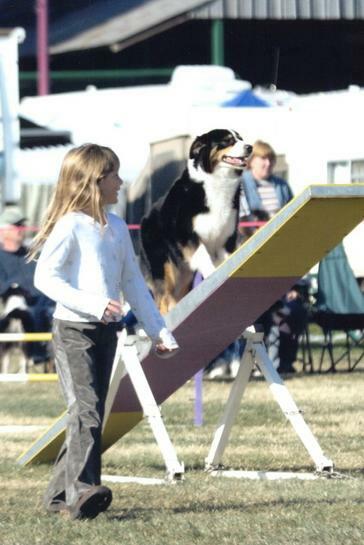 Kelsey learns most of her moves by watching other handlers in both agility ring and conformation rings. Look below at her kneeling and stacking Bobby Sue. I never taught her that. Actually, she takes very little direction from me. She wants to to it all on her own; from what crosses she is going to do, to how to walk a course, or how to do a handling pattern. We do have our moments over this as you can imagine. 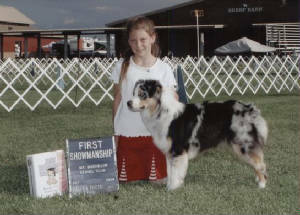 2006 was the first year Kelsey was eligible for AKC junior handling. She only showed in a couple of shows over the year. What little showing she did was done with style and grace. She has decided that Lapis is her dog to do junior handling with. 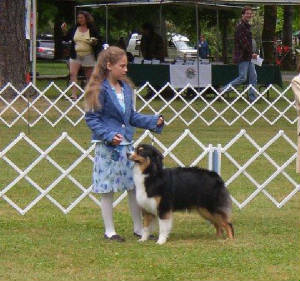 Additionally, She has also decided she is the one to show Lapis and Bobby Sue in breed ring. 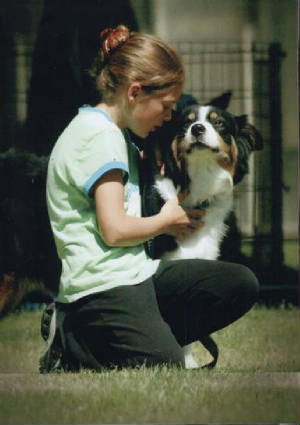 Both dogs work wonderful for her, and Kelsey does a beautiful job presenting them. However, She is looking forward to her next puppy being completely hers. Hopefully that puppy will present itself this year with either a Dazzle or Lapis puppy. Kelsey and Lapis the first time in juniors. Large class of 14 talented handlers. I work one day a week with Cecilia of Blue Sierra Yorkies grooming her dogs. This helps pay for the dog hobby we enjoy so much. Kelsey will frequently come and help out. One special quiet little girl named Rosebud attached herself to Kelsey. 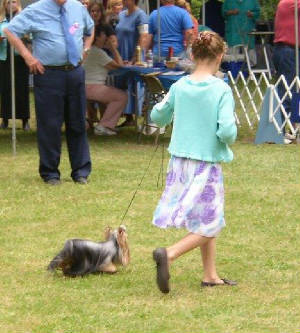 Cecilia allowed her to show Rosebud a couple of times over the summer and they even got a show picture of them together published in the Yorshire Terrier Magazine. 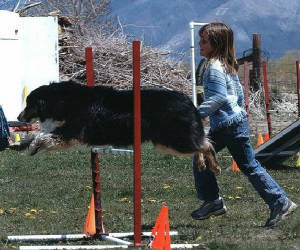 Kelsey did pretty well with a table breed and a different style of handling. 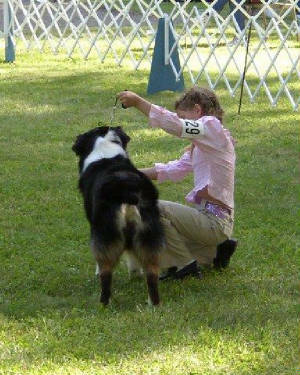 Watch for her next year in both the breed rings and junior handling rings.